The Borneo Jazz Festival kicked off its final week countdown with the “Roadshow to Borneo Jazz” at the No Black Tie in Kuala Lumpur on April 30th. 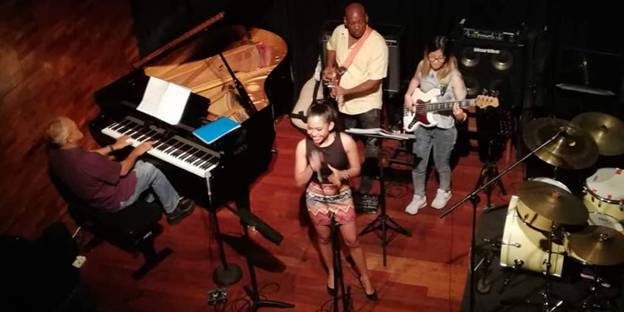 Coinciding with International Jazz Day, the Roadshow to Borneo Jazz featured a string of Jazz players that are set to perform in the festival in Miri, namely the Michael Veerapen Quartet andDasha Logan, NewSound, and this year’s finale artist, Nadir. The Borneo Jazz Festival, celebrating its 13thedition will be held for three days from May 11 at the Coco Cabana at Marina Bay in Miri. This year’s Borneo Jazz brings together renowned artistes from Poland, Italy, Switzerland, Belgium and Japan, with acclaimed Asian performers Gaoyang Li, Jeremy Monteiro, Michael Veerapen and Datuk Zainal Abidin as well as workshops, jam sessions, panel discussions and more! Single-day presale tickets are being sold at RM124.00, RM154.00 and RM84 for day one, two and three respectively, while students and senior citizen tickets are priced at RM64.00, RM84.00 and RM54.00 for the same. Two-day passes for the May 11 and 12 are being sold for RM254.00 on presale and RM124 for students and seniors. Three-day passes are sold at RM334.00 on presale and RM164.00 for students and seniors. The Festival is organised by No Black Tie Presents and is wholly owned by the Sarawak Tourism Board.